Heading for Delta Park, elephants and their handlers trudge in front of the original expanded G.I. Joe’s store in 1956 or 1957. They were part of a huge circus that put on shows for a few days. 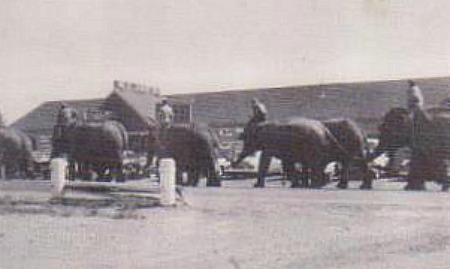 I remember going to the circus site and watching the elephants help put up the tents! It was almost a better show than seeing the actual performance in the three rings. My brother Corky and I had mixed feelings about circuses anyway, because we had seen a few movies that I think had scary clown murderers in them. I had thought that the circus was Ringling Brothers, Barnum and Bailey, but on the internet, I found a list of cities they toured in those years and it did not include Portland. Time for more research!